A large number of Continuously Operating GNSS Reference Stations (CORS) are operating today for multi-disciplinary applications ranging from surveying to numerical weather prediction. A sub-set of these stations are included in international GNSS observation networks (e.g. EPN and IGS). This participation ensures that all stations comply with a common set of standards for site monumentation, receiver and antenna equipment, data exchange format and that they maintain up to date auxiliary data. In addition, the GNSS tracking data from these stations are freely available through the internet. The first continuously operating GPS reference station in Belgium was installed in 1992 by the Royal Observatory of Belgium and was mainly targeting scientific research. Over the years, several additional tracking stations have been installed in Belgium. The ROB network was extended, but also each of the regions (Flanders, Wallonie, and Brussels) installed their own network of permanent GPS stations that are used as benchmarks for determining positions in the European ETRS89 or Belgian Lambert 2008 (NL, FR) coordinate systems. The ROB has installed several continuously operating reference stations in Belgium. The primary goal of these stations is the integration of Belgium to international reference systems. For that purpose, the station BRUS (located in Uccle, at the ROB), is participating in the International GNSS Service (IGS) since 1993 and it is part of the ITRS reference network. Since 1996, four stations (BRUS, DENT, DOUR, and WARE) have participated in the EUREF Permanent Network and are part of the ETRS89 reference network. The RINEX (Receiver Independent Exchange Format) data (at a 10-sec and 30-sec sampling rate) from these four stations are freely available through the internet with a delay of one hour. In addition, the stations DENT and WARE stream real-time data in the RTCM format thanks to the use of NTRIP. The Flemish government established an RTK (Real Time Kinematic) GPS-network based on 37 permanent GPS reference stations. This public FLEmish POSitioning Service (FLEPOS) has been active since 2002 and is operated by the Agentschap voor Geografische Informatie Vlaanderen (AGIV). The Flemish government aims at accurate, reliable and uniform positioning for all surveys by offering this service free of charge to all users, public and private. Since February 2007 FELPOS data can also be downloaded in real-time thanks to the use of NTRIP. The FLEPOS reference stations are located on buildings and the GPS data is sent in real-time to the control centre located in the offices of the Support Centre for GIS in Brussels. RTK services (using the RCTM format) are offered and in addition, RINEX data files with sampling rates varying between 1 and 60 seconds are made available through the Internet. The Walloon government established an RTK GPS network of 23 GPS reference stations. The service of WALloon Continously Operating Reference Stations (WALCORS) has been operational since 2003 and is operated by the "Direction de la Topographie et de la Cartographie (D.432)" of the Walloon ministry "de l'Equipement et des Transports". The WALCORS reference stations are installed on specially constructed 8 m high masts and the data GPS data is sent in real-time to the control centre in Perex. From there, the data are distributed by cellular phone, digital radio (DAB) or Internet. Both DGPS (Differential GPS) as RTK (using the RCTM format) services are offered and in addition, RINEX data files with a 1-sec sampling rate are made available through the Internet. The National Geopgraphic Institute (NGI) established an RTK GPS reference station in the Brussels region. The station is located in Ukkel on the premises of the Royal Observatory of Belgium. The GPSBru data are sent in real time to NGI from where the data are distributed in real-time to the users by cellular phone. In addition, RINEX data with a 10-second sampling interval are offered for post-processing applications. The service is free of charge. The EUREF Permanent Network (EPN) was created in 1996. It is a science-driven network of continuously operating GNSS reference stations covering the European continent. All contributions to the EPN are voluntary, with more than 100 European agencies/universities involved, and the reliability of the network is based on redundancy and extensive guidelines guaranteeing the quality of the raw GPS data and the resulting station positions. As well as to its key role in the maintenance of the ETRS89, the EPN data are used for a wide range of scientific applications such as the monitoring of ground deformations, sea level, space weather and numerical weather prediction. The EUREF Permanent Network (EPN) has been created in 1996. 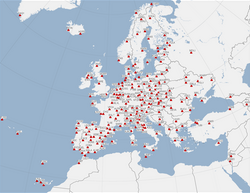 It is a science-driven network of continuously operating GNSS reference stations covering the European continent. All contributions to the EPN are voluntary, with more than 100 European agencies/universities involved, and the reliability of the network is based on redundancy and extensive guidelines guaranteeing the quality of the raw GPS data to the resulting station positons. Next to its key role in the maintenance of the ETRS89, the EPN data are used for a wide range of scientific applications such as the monitoring of ground deformations, sea level, space weather and numerical weather prediction. The most important product from the EPN is the well-monitored coordinates of the EPN tracking stations. These coordinates have a precision of better than a cm. Using relative positioning, we can use the EPN coordinates together with the data from the tracking stations, to determine the coordinates of any other GNSS site. The EPN Central Bureau is located and hosted by the ROB. The ROB operates an EPN GNSS data analysis centre. The ROB maintains an EPN GNSS data centre. Four permanent GNSS stations, installed and maintained by the ROB, belong to the EPN. Since 1991, the international scientific community has made a considerable effort to promote international standards concerning GNSS data acquisition and analysis. This was done through the deployment and maintenance of a global GNSS observation network. All the activities are supervised by the International GNSS Service (IGS), which is based on voluntary contributions from organisations all over the world. The IGS became a fully operational service in 1994 under the umbrella of the International Union of Geodesy and Geophysics. The IGS components are globally distributed permanent GNSS stations, data centres and analysis centres. The primary purpose of the IGS is to make available the necessary products allowing high accuracy geodetic and geophysical applications using GNSS: observation data from its tracking stations, accurate station positions and velocities, precise satellite orbits and Earth Rotation Parameters (polar motion and the variation of the length of day). Within the IGS all exchanges of GNSS data and products is done following a specific format; e.g. the RINEX format is used for the exchange of the GNSS observation data and the SP3 format is used for the precise satellite orbits. To ensure its participation in the IGS, ROB installed a GPS receiver on its premises in Brussels. This station has belonged to the IGS network since November 1993.